In the long list of intrusive, distracting, potentially dangerous, and downright bad outdoor advertising ideas, putting the equivalent of a digital billboard in the rear windows of SUV’s and other vehicles has to rate as one of the worst. 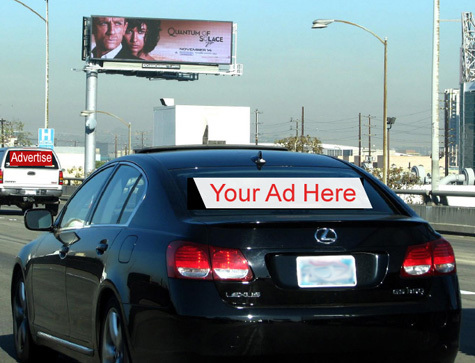 But if a Minnesota company called Rear Window Media realizes its vision, streets and highways will one day be filled with these vehicles flashing ads for the driver behind, who will likely need to tailgate to get a clear look at ever-changing pitches for products and services. The company is promoting this as a safer alternative to digital billboards. Are they serious? Apparently so. Check it out.